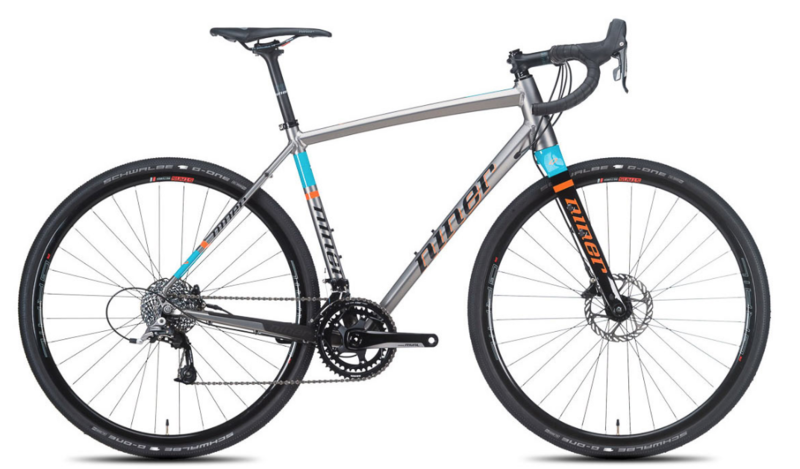 What is the difference between a gravel bike and a cyclocross bike? Good question. They'll both have disc brakes, drop bars, thru axels, wider tires than road bikes, more narrow tires than mountain bikes, and tough frames. But while they are similar, they are specifically built for different kinds of riding and terrain. Basics: A gravel bike is designed for longer and more adventurous endurance rides. It's not great at intense racing and jumping over barriers. Geometry: A gravel bike has a more relaxed endurance-based geometry with a higher front for better comfort on long gravel roads. Tires: Gravel bike tires are generally at least 40 mm wide. This allows for beautifully expansive front fork clearance. Basics: A cyclocross bike is designed for short (1 hour) intense & aggressive cyclocross races. It's not great at long endurance rides on gravel. Geometry: A cyclocross bike has aggressive race geometry for stiff twitchy responsiveness. Tires: Cyclocross bike tires are 33mm at the widest (which is a funny UCI rule). This leads to tighter front fork clearance. What is the difference between a gravel bike and road bike? Also, a good question. These two bikes are actually a little less similar than the comparison we did above. While some (but not all) road bikes may have disc brakes, ALL gravel bikes will have disc brakes. And while you could ride a road bike and gravel, and you could ride a gravel bike on the road, neither will be as efficient as the other in its designed terrain. Basics: A gravel bike is designed for longer and more adventurous endurance rides on gravel and mixed surfaces. It's not made for aerodynamic crit racing on smooth tarmac. Geometry: A gravel bike has a more relaxed endurance-based geometry with a higher front for better comfort and functionality on long gravel roads. In short, it's a better all-a-rounder. Tires: Gravel bike tires are generally at least 40 mm wide. This allows for lower PSI (which leads to greater comfort) and beautifully expansive front fork clearance. A gravel bike will also feel less twitchy than a road bike. Basics: A road bike is designed for aerodynamic and efficient pedaling over smooth tarmac and well maintained roads. It's not great at venturing onto anything but smooth pavement. Geometry: A road bike is lower and longer than a gravel bike to facilitate a laid out / aerodynamic position (but. the position requires some (i) some patience and (ii) a strong core). Tires: Road bike tires are generally 23 mm to 28 mm wide. This requires a higher PSI which makes the ride less supple than a gravel bike, but more responsive. The road bike will have less rolling resistance. Finally, what is the difference between a gravel bike and road bike? Big differences here. Generally, a mountain bike will have suspension while a gravel bike will not (other than the Cannondale Slate). Both bikes should have disc brakes and thru axels, but the two bikes are designed for completely distinct goals. Basics: A gravel bike is designed for longer and more adventurous endurance rides on gravel and mixed surfaces. It will also perform MUCH better on smooth roads than a mountain bike. But, it's not made for bombing technical downhill singletracks. Geometry: A gravel bike is more similar to a road bike than a mountain bike. It has drop bars for comfort and aerodynamics and flexibility (vs. a straight handlebar on a mountain bike). A gravel bike will also be lighter than a mountain bike. Tires: Gravel bike tires are generally at least 40 mm wide (which is MUCH more narrow than a mountain bike tire) and don't contain as much tread as a burly mountain bike tire. This allows for higher PSI compared to a mountain bike (which leads to less rolling resistance and quicker accelerations). Basics: A mountain bike is designed for intense and technical trails and singletracks. It doesn't do so well on long gravel paths or roads simply because (i) it's not aerodynamic, and (ii) its wide tires create LOTS of rolling resistance. Geometry: A mountain bike's geometry is incomparable to a gravel bike because of its suspension (front & rear in some cases), and wide WIDE tires. Also, the frame tubing is usually wide and durable. A mountain bike will also be heavier than a gravel bike. Tires: Mountain bike tires are can be as wide as 2.5 inches and contain knobby treads for traction. They are monsters. They run at much lower PSI than gravel bike tires to be able to better roll over roots and rocks. The tradeoff is that these big tires are horrible on roads or gravel paths.